After several weeks of rain (the word no racer or race track likes to hear), the Southeast Super Truck Series finally had a clear weekend to race. Saturday June 16, the series rumbled back into Hudson, North Carolina. Home of Tri-County Motor Speedway, which has hosted some of the best side by side racing to date in the history of the series. The rough surface, has little effect on the drivers other than a few rough bumps here and there. After three races into the season, everyone was stepping up their game trying to reel down current points leader Kenneth Headen. The sun shined bright and the Summer time heat was lingering a week earlier than what the calender showed. Everyone got set to go out for the first round of practice on the 4/10th's mile facility. Local hometown hero, Jason Cochran who has competed at TCMS for several years topped the charts. Cochran was followed by past Gripp Energy Limited Late Model (formerly known as the Southeast Super Stocks) stand out Tyler Worley, and young super star Ashton Higgins in third. They went back in the infield and dialed their trucks in for the final round of practice. Cochran who is known as "High-Line or High Side Cochran" paced the field one more time for the final practice session, this time he was followed by Headen in second, and Higgins in third. The teams went to work heading through the tech inspection and lining up for Qualifying. It was the points leader Headen who claimed the Renegade Race Fuels Pole Award with a blistering time of 16.605. Cochran set the second fastest time, followed by Higgins in third. Headen rolled a five on the invert dice. 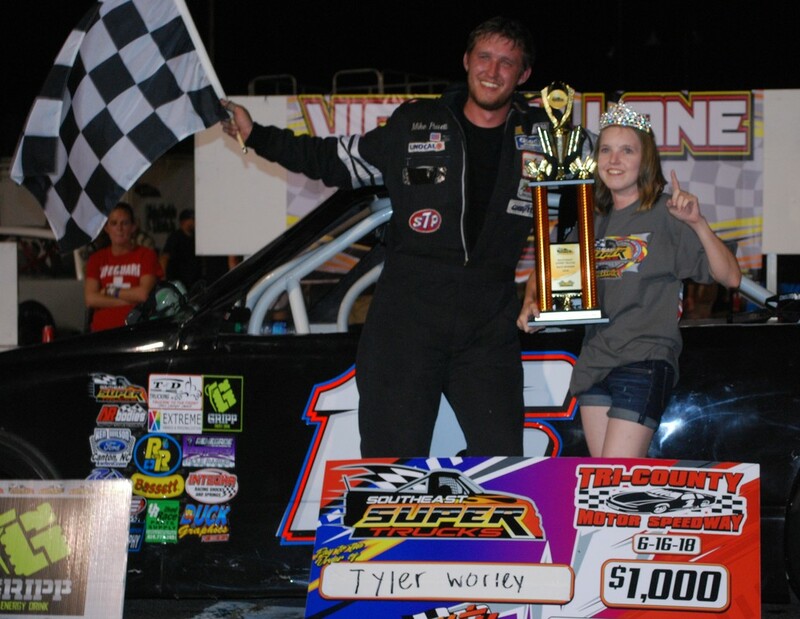 Which now set newly Wed Tyler Worley starting on the top spot with Florida's female phenomenal driver Taylor Hosford on the outside of the front row. "We was actually shocked with the pole run, We knew Jason and Ashton were going to be the trucks to beat, so starting 5th after the invert our team knew we had to go hard to the front fast" stated Headen. After the drivers lined up on the track, it was Tyler and Taylor who paced the field around the track behind the City Chevrolet Silverado. Worley quickly set his marks and dove in front of Hosford to maintain the lead. However it didn't take long for the young super star of Higgins to catch and reel in Worley. Meanwhile a three way battle for third was breaking out, as Hosford was trying her best to hold off Cochran and Headen. Cochran was able to capture the third position, however Headen followed him in his tracks. The pair went on to race side by side again for the third place. The first caution flew on Lap 10, as Cochran and Headen racing hard for position collided with each other on the back stretch and both spinning. Higgins who was able to take over the top spot just before the caution flew, led the field back to the green flag. However it didn't take long before Worley worked his way back around Higgins and back to the front. The caution flew again on Lap 19, as Cochran slowed coming out of turn two. Cochran came down pit road and to the attention of his crew, however repairs could not be completed before the green flag flew again. Worley led the feild back to the green flag, with Higgins fighting hard to re-take the lead. The third caution flew, as #5 of Toby Hollifield spun in turn two. Hollifield has been improving each week and been consistenly running in the top 5 each week. Higgins led the field back to the green flag, but Worley wanted the top spot back. Worley was able to re-capture the lead, and pull away. Meanwhile Higgins started experiencing mechanical problems and falling back through the field. The field crept into the final 15 laps of the feature. Headen began to catch Worley for the lead, and Hosford was following Headen right in the tracks of the top two trucks. “I originally wasnt planning on saving but when Higgins got around me after a fun close race with him as always I sat back and rode for a few laps to see if I could save and when I decided to go again is right before he broke.” Stated Worley. With just a handful of laps now left in the feature, Hosford caught Headen and they raced side by side lap after lap. Until Hosford was finally able to move past the past champion of the series. Hosford now set her sights on the leader Worley with just a couple laps to go. Worley took the white flag, the final lap, the one everyone has been waiting for all night. The top two raced as hard as they could down the back stretch, however two slower trucks right in front of the leaders had spun in turn three and four. Worley went high, Hosford dove low, however the outcome wasn't what everyone anticipated for. Worley changed his line and went to dodge the trucks sitting on the track and dove right in front of Hosford. The whole field bunched was now caught up in the last lap mayhem. "I was right there on him (Worley) coming out of turn two, I seen the two trucks spinning in turn three-four and they was at the top of the track. I knew the bottom had a clear path, which is where I had been running all night. Tyler went high and I dove low. About half-way through the corner I seen him coming down to avoid the spun trucks and I t-boned him." said Hosford. The points battle is beginning to tighten up between leader Kenneth Headen and 2nd place Taylor Hosford, with just 10 points seperating the Rookie from the Veteran. “This was probly the most emotional win I've ever had. I've been with the series since the first race in 2012 and to finally get my first truck win was very emotional. Especially on fathers day weekend when my dad had done so much work to get the truck where it needed to be” Worley stated. The series will return to Anderson Motor Speedway on June 30th.